KANSAS CITY — Before trailblazer Marlin Briscoe would begin an interview about Kansas City Chiefs superstar quarterback Patrick Mahomes, Briscoe had a few questions of his own. And he got right to the point. The evolution of the black quarterback may have reached a new level. Black passers have led teams to the Super Bowl. They’ve won the Associated Press NFL Most Valuable Player award. One is even enshrined in the Pro Football Hall of Fame. Never, however, in league history has a classic dropback African-American passer been the consensus No. 1 player at his position in any era, let alone for a long stretch. At only 23, Mahomes appears poised to be the first to take up the mantle. Of course, he’s still got a lot of work to do. Mahomes could take a significant step toward beginning his reign by leading the Chiefs over the visiting New England Patriots in Sunday’s AFC Championship Game. With his five Super Bowl titles, Patriots quarterback Tom Brady, 41, is roundly considered the greatest of all time. For the right to advance to his first Super Bowl, Mahomes must go through the GOAT. Talk about potential pass-the-torch symbolism. Over the past two decades, Brady has embodied the art of playing quarterback. No one in the game has done it more efficiently or effectively. Brady raised the bar higher than it has ever been. This season, Mahomes pushed the bar in a different direction. From his no-look throws, passes thrown from contortionist arm angles and video game-like stats, Mahomes, in only his first season as a starter and second in the NFL, has made us reimagine what’s possible. That’s what Briscoe is talking about. Way back in 1968, Briscoe, then a rookie with the Denver Broncos, became the old AFL’s first starting black signal-caller. After racism ended his career as a passer, Briscoe reinvented himself as a Pro Bowl wide receiver. Whenever the Chiefs play, the Long Beach, California, resident makes sure he’s in front of his television. According to Briscoe, there’s no better show in football. 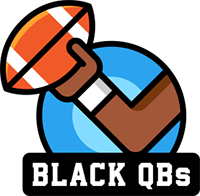 In the 1988 Super Bowl, Doug Williams took a sledgehammer to the racist myth that black passers lacked the smarts and leadership ability to win championships. By the time Russell Wilson helped the Seattle Seahawks crush the Broncos in the 2014 Super Bowl, his race wasn’t the biggest story of the day. Likewise, when Cam Newton led the Carolina Panthers to the 2016 Super Bowl, he didn’t face a volley of questions about whether he measured up. Both Steve McNair and Newton won the league’s MVP award. Warren Moon’s bronze bust is in Canton, Ohio. Randall Cunningham was known as The Ultimate Weapon. There have been some highly accomplished African-American quarterbacks. Here’s the thing, though: Cunningham and Moon played during an era in which Joe Montana, Dan Marino and John Elway took turns standing atop the mountain. From the time Newton and Wilson entered the league, the long-running debate was whether Peyton Manning and Aaron Rodgers were better than Brady. The Mahomes era has a nice ring to it, pioneer James “Shack” Harris said. Harris was the first black quarterback to start a season opener as well as the first to start and win an NFL playoff game. In 1974, Harris was selected to the Pro Bowl. Also a longtime NFL player-personnel executive, Harris, now retired, has studied Mahomes’ game closely. “I couldn’t be more impressed,” he said on the phone. “What you have to have to be great, to be special, is to play quarterback with instinct. It’s not something you teach. You’ve just got to have that. He does. With Mahomes, Reid has made all the right moves, beginning with having the then-rookie sit and learn last season behind veteran Alex Smith. Reid is among the best in the business at putting quarterbacks in position to thrive. In Mahomes, Reid, who once mentored a young Brett Favre and had a long, fruitful run with Donovan McNabb, has the most gifted protégé of his career. The tools are all there, Reid said. The greatest quarterbacks of every era have been geniuses at their craft. Mahomes’ unconventional ability to extend plays by throwing from myriad angles is part of what makes him unique. Reid gets that. Brady and New England head coach Bill Belichick have had the most productive quarterback-coach partnership in NFL history. The Montana-Bill Walsh union produced three Super Bowl titles. Although Marino and longtime Miami Dolphins head coach Don Shula never combined to win a Vince Lombardi Trophy, Shula recognized what he had in Marino and facilitated the future Hall of Famer’s ascent. Reid also knows exactly what he has in Mahomes: the total package. Who will Mahomes ultimately become? The fun part, especially for black quarterback pioneers, will be watching for the answer.